You will make four recordings of yourself walking. 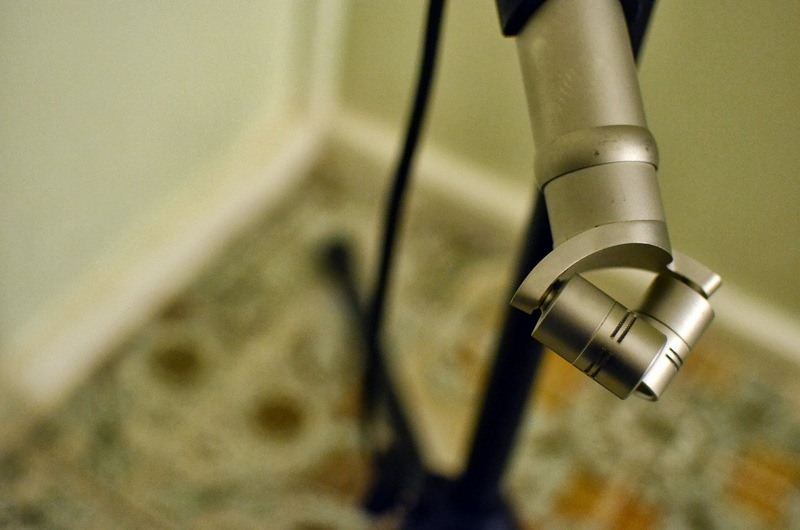 You will then combine those recordings as you see fit into a single original piece of music. You will add nothing to the four recordings. You can cut up and otherwise transform the source audio as you see fit, but it should always be recognizable as the sound of walking. The resulting track will explore various themes, including texture, rhythm, percussion, momentum, and the inherent musical qualities of field recordings. Simple but easy to complicate. 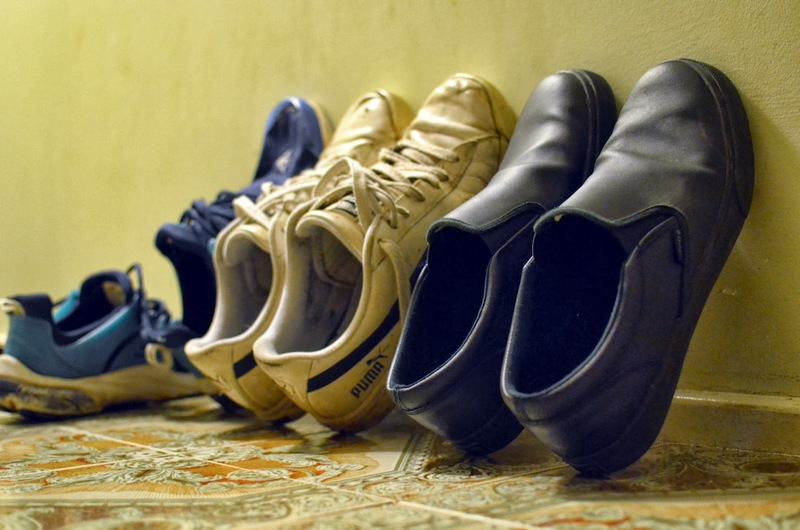 I began thinking about ways to record footsteps, like using a contact microphone on a nearby metal footbridge, but decided I should see what sounds I could get from different footwear and try to capture them sounding more like they do. 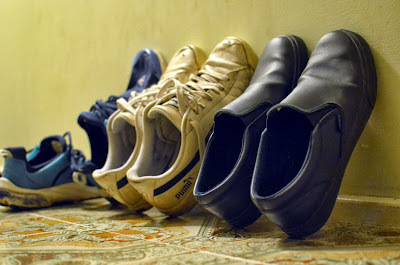 My shoes are all sneakers and they had different squeaks on the tiles in the kitchen. I decided to work with those and used my Rode NT4 microphone to make the most of the stereo effect as I walked around the room. I experimented with different microphone positions and different shoes and also recorded one take barefoot to emphasise a couple of creaks. After settling on four recordings, I sought short loops to find percussive tones. These were gated and given a little EQ for definition. 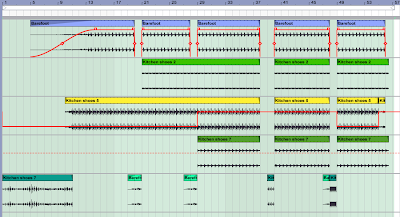 Ableton's Beat Repeat was used for the variations. There were a few different loops using the four recordings and one using four loops from one recording but only one collection caught my ear, which is the main part of this track. It seems to swing in a way my other loops did not. In the middle-eight section I changed the pitches of some loops. The title 'Dubbed Step' doesn't really capture the style of this track but I liked it too much not to use it. This song reminds me of basketball, particularly a Michael Franti lyric about "the squeaking of the sneakers and the echo in the hall". This afternoon I played it to my partner and suggested some of the sounds might not be recognisable as walking. "The Junto haven't seen you walk," she replied, which has some merit as my walk has been mocked and ridiculed at times. Her father once remarked it "looks like there's something up his backside and he enjoys it"! Anyway, I think this is my 30th Junto. 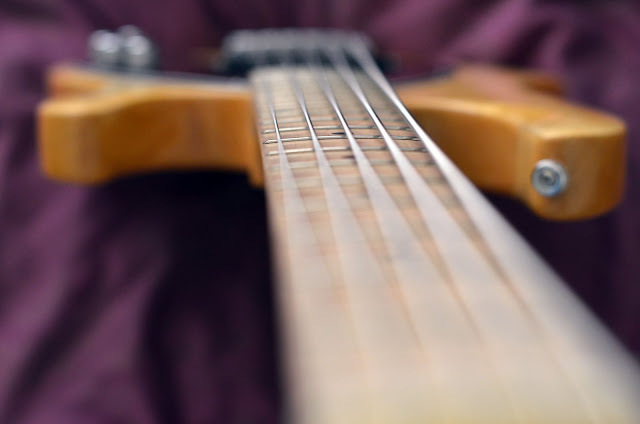 Percussive Maintenance from Duncan Robson on Vimeo. Another friend of mine in England suggested that with sampling you’re not just sampling the notes and the sounds, but the essence of the recording, you’re somehow using the spirit that’s in there. If you start getting into quantum physics, there’s really nice stuff about a particle that’s simultaneously in two different locations in space and time. That’s what’s amazing about recording, the tension of a particle existing simultaneously in a studio in 1998 and coming out of your speaker in 2012. When you layer up samples recorded in different eras and different locations with different people that quantum voodoo is amplified exponentially. I really believe in that, but it’s tricky to explain! These are excerpts from a recording to accompany an exhibition called Re-imagining the Murrumbidgee that'll open in Leeton this December. This will be my first release using my given name. 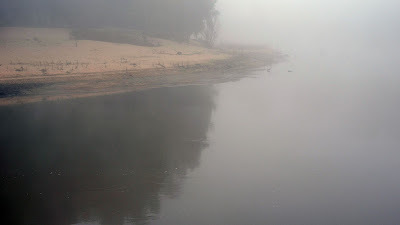 I was excited to be involved in this project as I've lived near this river most of my life, from being born on the tributary Molonglo River at Lake Burley Griffin in Canberra and then moving to Wagga Wagga and now Leeton in the Murrumbidgee Irrigation Area. On average the body of an adult human being contains 60% water. Since I've been drinking water from this river and its tributaries pretty much all my life, the Murrumbidgee is a significant part of me. Keen ears will recognise the sound of frogs, who featured in a Disquiet Junto piece last month. Those sounds will serve as the source material for your track. Now that Voyager 1 has left the solar system, you will write a short piece of goodbye music to send it on its way, using these sounds recorded in the outer space. You can add whatever you want to them, and you can transform the noise as you see fit, but you should retain elements of the original source material so that it remains recognizable to the listener. In particular, pay attention to the source audio's melodic content. On Friday night I developed the basic elements of my track, manipulating Voyager's recordings to create percussive elements and a pitched down loop for the bass. This bassline was then treated using Sinevibes' Reactive and Frequency effects, which are great for making noises into something more musical. Then I added a few notes using one of Ableton Live's organ instruments, thinking it was the sort of sound that came from the decade of the satellite's construction. The 707 drum machine came about a decade later though. Sunday morning I started arranging the parts, settling on introducing the Voyager loops first and keeping a grainy texture throughout. Live's Utility effect was used to invert the phase of some loops for stereo effect and Autopan was used to exaggerate this width. Aside from the subject matter, creating space has been on my mind since the last Junto. Valhalla's Shimmer was used to create the synth-like reverb effect on the organ at the beginning and I automated the shift function towards the end to create that descending sound. Tape delay effects can also be heard as I've read the satellite uses tape. Guess I reversed the melodic content of the recording, dropping pitches rather than raising them like the plasma waves in the Voyager recordings but I'm happy with the result. Your track will last one minute and thirty seconds. For the first 30 seconds, the drone and the beat will remain consistent, but the melodic fragment will move around in 3D. For the second 30 seconds, only the beat will move around, and for the final 30 seconds, only the drone will move around. Recently I've enthused about the Junto for providing a sound education and this exercise encouraged me to try new processes as well as providing an opportunity to use new effects. The title of my track refers to the national election being held today in Australia. I haven't been in to vote yet and the polls are saying that the conservatives will win the lower house but hopefully not the upper too. My melodic fragment is a section of a bassline from an old song, Wandered. This morning I recorded the bass and the opening guitar chord, which became the drone using the infinite button in Audio Damage's Eos reverb. The beat was quickly assembled in Ableton Live using their percussion kit. 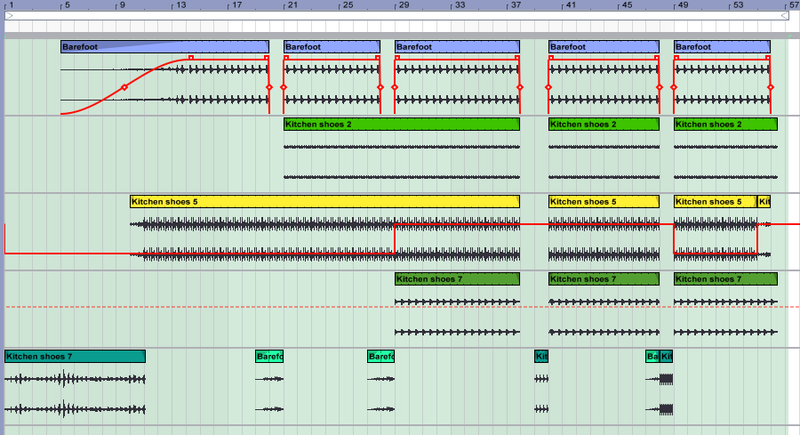 You can hear the bass come panning in from the right and into focus by automating the wet/dry ratio on the reverb. The percussion goes the opposite way, becoming wetter but also gaining stereo separation with Live's utility on the 'difference' preset -- which I think is mid/side processing. And, finally, the drone goes out to the right while being pushed around by a pan effect and gaining reverb. It was difficult to get much sense of movement with this part, since there weren't any transients to colour with reverb. This "dangerous" fence looks like it'd play a melody when you run a stick along it. 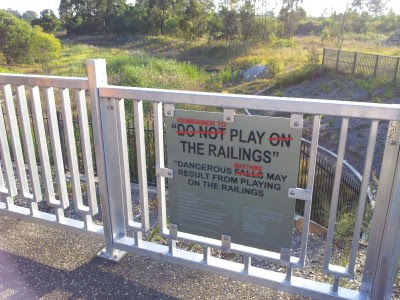 My father sent these pictures, so I've sent him back to the town of Carseldine in Queensland to let me know what song. 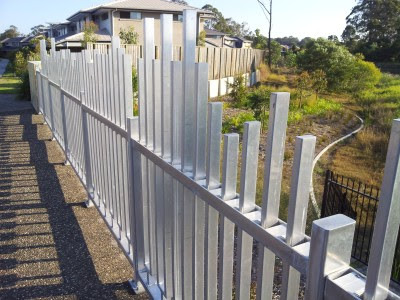 Queensland is also home to another musical fence in the town of Winton, which was designed by Graeme Leak and has inspired popular musician Gotye, according to the video below -- which I found (along with myself) on the Playgroundology blog. The Making of Eyes Wide Open from Gotye on Vimeo. And apparently there are many more musical fences to be found in Europe. Thanks to Herofukutu for the link.